Somerset’s emergence as a creative getaway with an artsy twist continues with the opening of the first guest room at Caro, a small concept store just off Bruton’s High Street. 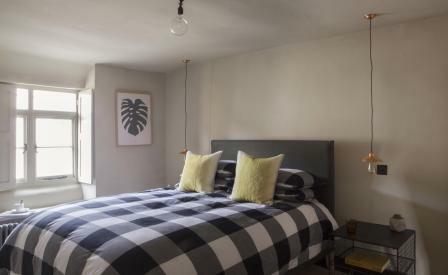 Downstairs is a three-room café and shop selling a range of homewares from Kaweco pens to Gwalia enamelware, while upstairs, the bedroom (there are more in the pipeline) is carefully pared down to express what the owner calls ‘style that I like’. Natalie Jones’s impeccable credentials (ex Future Laboratory and Winkreative) make her a valuable arbiter of this new genre of independent micro B&B with a model that looks ripe for imitating. That is: a simple, almost utilitarian feel juxtaposed with atmospherically wonky floors and rippled walls of the 18th-century stone cottage. Murky West Country shades of dusky pink, surrealist wallpaper and super personable service add to the individual feel; a huge bathroom with Dovecot views is the luxury touch. There’s no TV or food (apart from coffee and swanky Bakemonger cakes), but that’s little hardship when nourishment comes from At the Chapel up the road and entertainment comes in the form of Hauser & Wirth’s country outpost or the area’s outdoorsy rural charms.